Successfully Added Super Sound 2-Din Car Video Audio DVD Player with Bluetooth to your Shopping Cart. Super Sound 2-Din Car Video Audio DVD Player with Bluetooth. 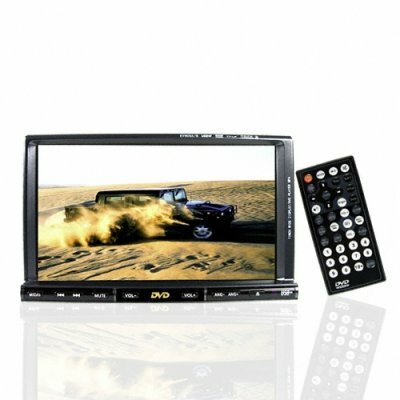 Double DIN (100mm tall) car DVD player for playing your digital audio and video media as you are driving, and featuring Bluetooth connection with your phone for safety while on the road. With such features as a massive 7 Inch screen with adjustable screen angles and touchscreen control, excellent compatibility with many digital formats and disks, Video IN and RCA out for multiple connection possibilities, and a built in TV tuner with PAL, NTSC, and SECAM decoding, this is a beefy addition to any car. Make your car shine with this highly vehicle multimedia entertainment center, and do it at a factory direct price! Order yours right now, from Chinavasion.com! i ordered this unit and i recieved it in 10 days. so far it has been a great investment. it sounds good and plays good, i was wondering that if i bought it & hooked it up i might hear the component spinning the disc, but that has not happened. the price was right too. the only complaint is when the unit is cold the touchscreen flutters until it warms up which usually takes about 10 minutes. then it's fine. over all, i would recomend this unit to anyone seeking an upgrade that looks like you spent a fortune.